If the smell of hot dogs, fireworks, and unabashed patriotism is in the air, that can only mean one thing: July 4th is just around the corner. If you’re visiting Walt Disney World this upcoming July 4th holiday weekend, there are a few special events and performances planned to make your weekend just a tad bit more American. 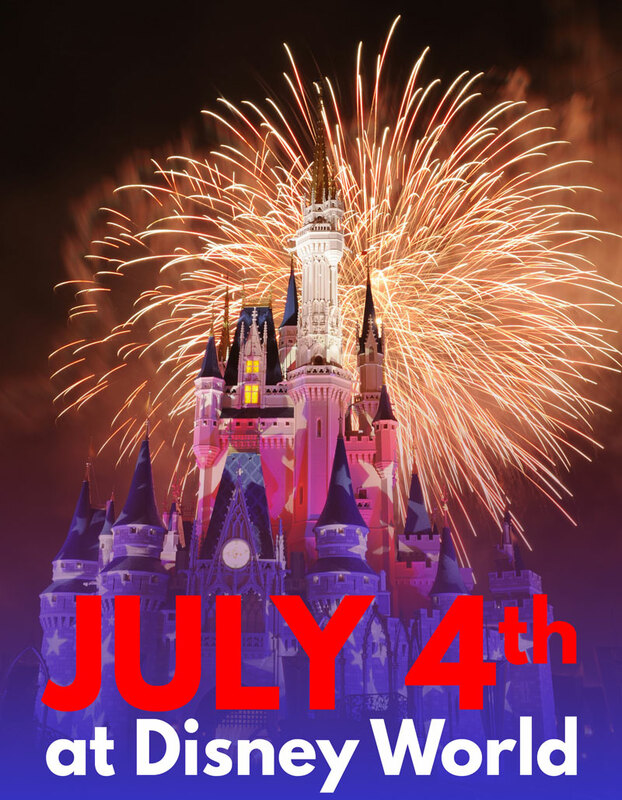 The fireworks will take place on July 3rd and 4th at 9 pm above Cinderella Castle. Want to check out the fireworks but wary about the holiday crowds on Main Street? Be sure to check out our guide on the Best Places to Watch Magic Kingdom’s Fireworks Other Than Main Street. July 4th IllumiNations Finale: Magic Kingdom isn’t the only park with special July 4th fireworks, as Epcot’s IllumiNations will feature a special Americanized finale at 10 pm on July 4th. Voices of Liberty: Epcot’s most patriotic a cappella group will be out in full force on Independence Day. They will have special performances at the America Gardens Theatre in the American Adventure Pavilion at 12:30, 1:45 and 3 pm on July 4th. Voices of Liberty will also perform inside the American Adventure Rotunda at 4:15 and 5 pm. 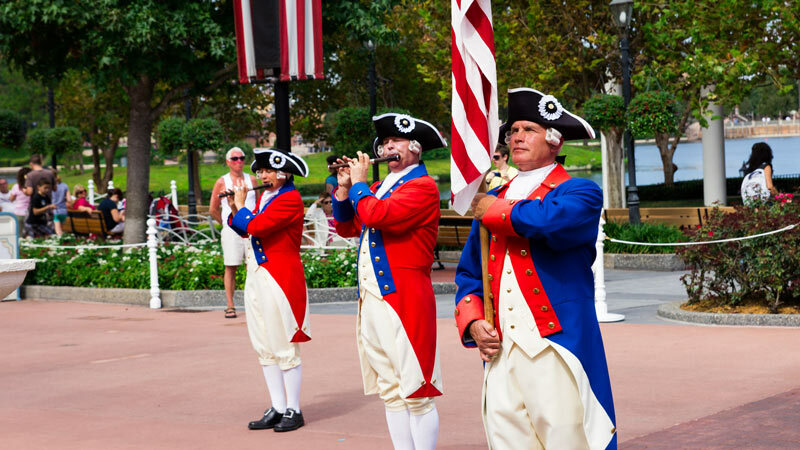 Spirit of America – Fife and Drum Corps: After being retired in 2014, this popular World Showcase entertainment act is back for a limited engagement. They will perform on July 4th outside American Adventure at 1, 2:15, 3:30, 4 and 4:45 p.m.
Star Wars: A Galactic Spectacular: Nothing says America quite like Wookiees and BB-8. Ok, this one is a bit of a stretch, but Hollywood Studios’ newly plussed, next generation fireworks show Star Wars: A Galactic Spectacular will perform at a special time on July 3rd and July 4th: 9:30 pm. To my knowledge, there will be no special July 4th theme for these fireworks, unless Kylo Ren’s lightsaber suddenly turns into the American flag. So, that’s it for July 4th at Disney World. For what it’s worth, we’d recommend seeing the Magic Kingdom’s fireworks on July 3rd and checking out IllumiNations on July 4th. Chances are crowds will be slightly better on July 3rd at the Kingdom, and Epcot has special events planned that are only on July 4th. Wait to check out the Star Wars fireworks another night, since those will be playing for the foreseeable future. If you’re visiting this holiday weekend and looking for the latest and greatest at the parks, check out our rundown of Everything New at Disney World This Summer. And if you’re still feeling patriotic, don’t miss The American Adventure at Epcot, The Hall of Presidents at Magic Kingdom, or Muppet Vision 3D at Hollywood Studios (this post’s title is a reference to that show).